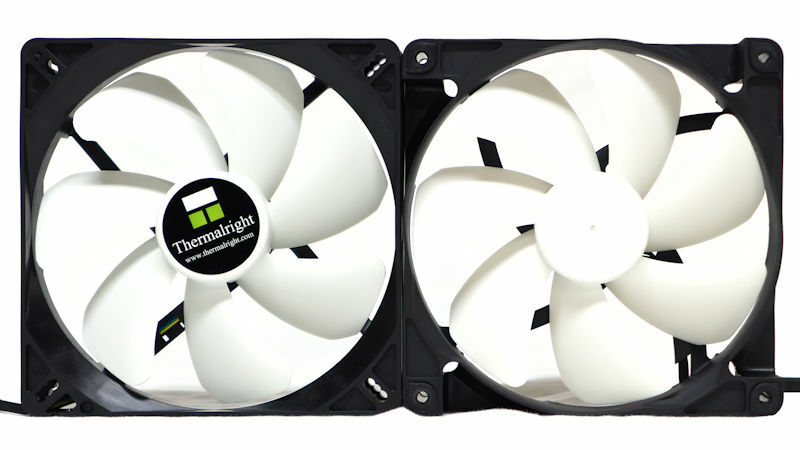 Thermalright has finally put their PWM fans in square frames. 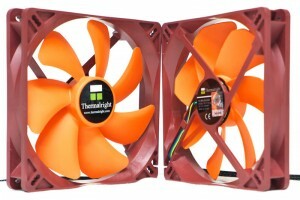 Long known for their excellent 140 mm PWM heatsink fans, Thermalright finally have those fans ready for radiators. Enthusiasts have admired those blade shapes for years, but they never fit cases or rads, only heatsinks. The TY series of 140 mm fans have long been standouts in the field of air cooling. They pioneered the use of side vents, for example, improving the cooling of 140 mm fin stacks. The TY fans were 150 mm wide, so that when 150 mm fin stacks were introduced they were perfect for accepting TY fans. The TY series has now expanded to include square frames, so they can be placed on 140 mm radiators. With PWM control, they can plug into PWM splitters where they get their power directly from PSU’s to avoid overburdening the motherboard, and still letting you control your fans without needing a separate fan controller. Thermalright sent pairs of these to review, so let’s look at these fans. 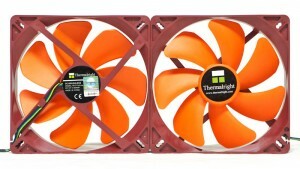 Thermalright was started in 2001, which is a long time ago for the computer age. They say, “We have set many standards in the cooling industry which are still widely implemented today, and have been the leading brand that others tend to follow and imitate.” Following this provocative statement, they back it up with a parade of products. They don’t even mention their tandem tower heatsinks, but the IFX-14 was a pioneer in its day. Seven Silent Torpedo Blades – “submerges”, gives most quiet and efficient airflow. 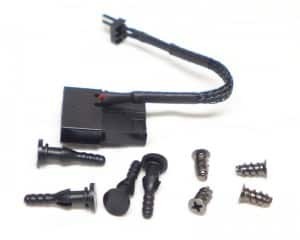 Includes tooling-free Anti-vibration Rubber screws and 4P molex connector for use on the chassis fan. 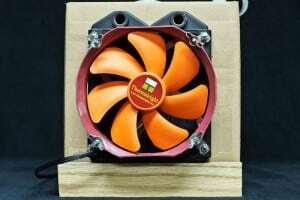 The fan is compatible with 140mm water cooler. Two Ball Bearing and metal bearing shell – to ensure consistent and stable rpm, prolonged lifetime of usage. 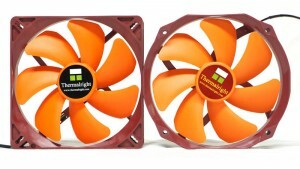 All Thermalright SQ series fans are under two year warranty. (This fan is designed with PWM function, and full speed will apply when plugged into 3 pins instead of 4 pins. The TY-141 SQ can be plugged into the 3 pin. Enhanced Hyper-Flow Bearing (EHFB) – to ensure consistent and stable rpm, prolonged lifetime of usage. 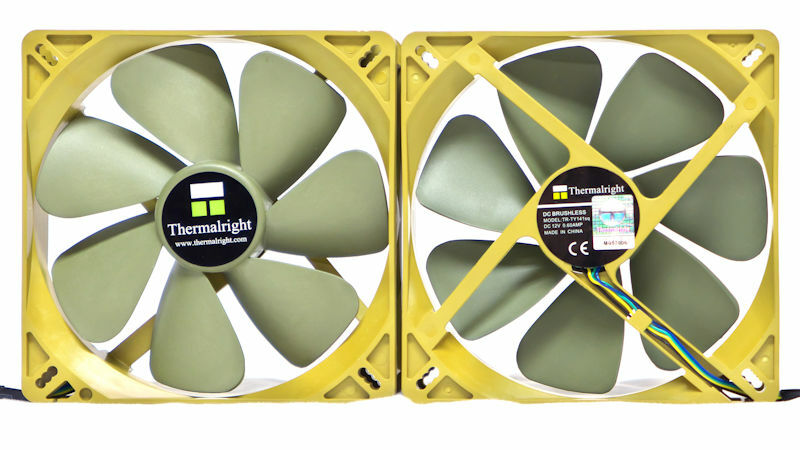 The TY series of fans come to us in fully recyclable cardboard boxes. You will find the features and most specifications on the back. On the front there is a window to look at the fan inside, along with the fan’s speed. 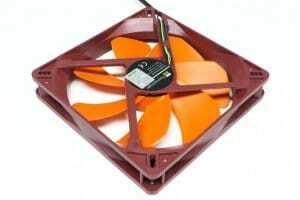 When you reach inside you find a clear plastic tray, which holds the fan and its accessories in a gentle embrace. If you have an X-Silent 140, you will say, “Hey! The tray looks exactly like the one holding that one.” But my contact at Thermalright assures me that these trays come out of different molding machines. A set of accessories come with the fans. One lets you can plug a fan into your PSU. Then there is a set of vibration isolators. I recommend vibration isolators whenever you attach a fan to a case. 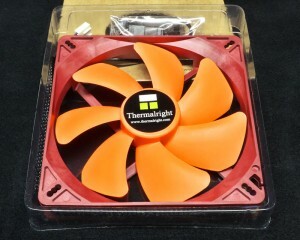 Finally, for those of you who are really stubborn, Thermalright includes a set of standard fan screws. The upper picture shows the exhaust and the intake sides of a pair of TY-143 SQ fans. My contact at Thermalright tells me that the triple-holed screw positions are there to accommodate alternate screw patterns. You can see from the first shot how the TY-143 SQ differs from the earlier TY-143. The TY-143’s frame is wider with the flared sections covering more of the fan. If you look at specifications, the earlier fans have about 10% more CFM than the square fans. In the next picture, you can see how a competitor fan has an identical-looking impeller to that of the Thermalright TY-147A SQ. But the round-frame TY fans have been around years longer. A close-up of the frame shows that the intake is sloped. The corner have walls, which makes installing fans easier. The frames are open at the extreme corners, which allows access to the screws. The exhaust side shows the same flared corners, making for a symmetrical fan, front and back. The fans were run in open air, while their RPM and SPL were measured. The Sound Pressure Level was measured with a Tenma 72-942 at 10 cm. The reading was then adjusted to the industry standard 1 meter. But just when I was getting ready to measure CFM’s, my Extech AN100 died. I replaced it with another of the same model. Because this was all done with a new anemometer, all of the measurements had to be redone. 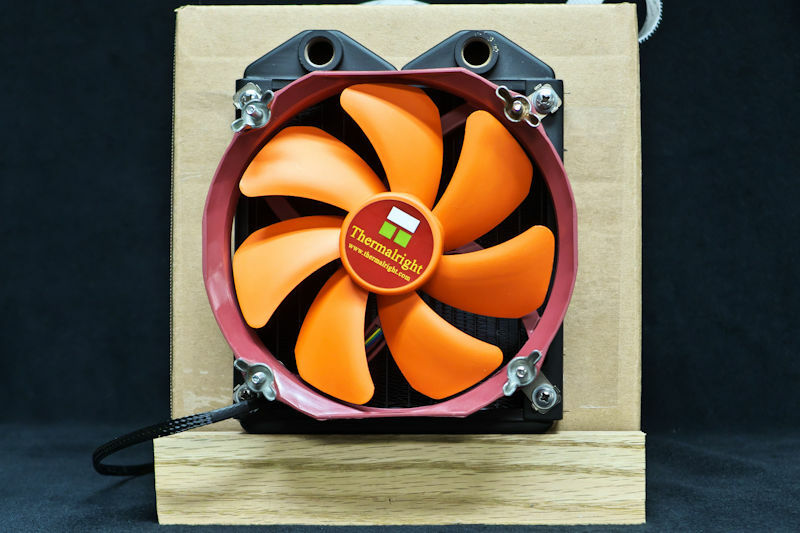 The airflow output was tested in 8-inch cube boxes with 136 mm outflow port. The vane head of the anemometer was held in the port and measured the outflow. Ten measurements were collected and presented by the anemometer as an average reading. Sequential averages tended to be within a few CFM of each other, so the anemometer was reliable. Because the anemometer was not calibrated with NIST, the average readings can only be compared with each other. Their relation to absolute flow measurements can only be approximate. 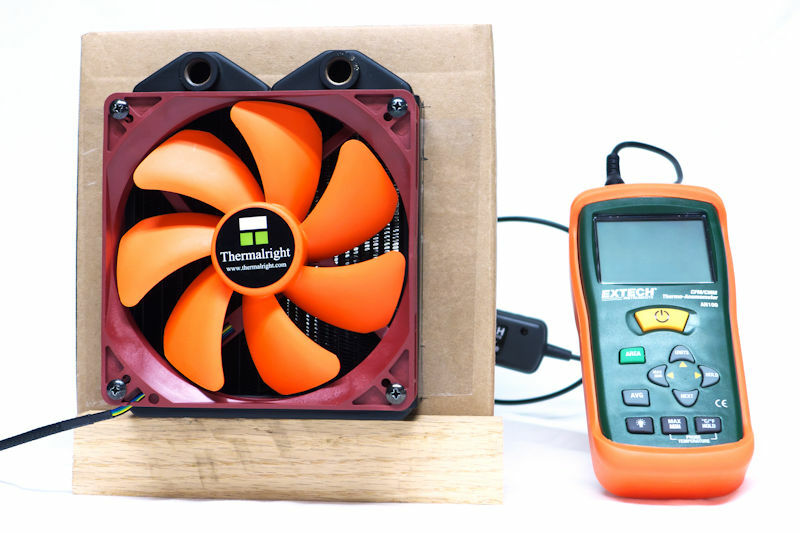 When two or more fans of the same model were available, they were both measured and their outputs were averaged. The airflow of these fans were measured in CFM, both with no obstruction and with a 30 fin per inch 140mm Koolance radiator in the airpath, so these PWM could be tested in a realistic rad environment. The first picture shows a TY-143 mounted on the 30 FPI rad. At the corners are four 120-140 adapters scavenged from an old retail NF-P14. The fan fits the rad, but it’s not perfect: Some air escapes, for example. Now that we have the TY SQ fans in hand, they can be properly assessed. The second picture shows you the TY-143 SQ mounted on a measuring box. The handle of the vane head of the anemometer can be seen at the back. The fan frame fits the rad perfectly. The outputs of the various fans are all there, in order. What you probably don’t realize is that they were placed in order of their CFM through the radiator. Do notice how quiet the TY-147A SQ is, and how much more air it pushes through the radiator. 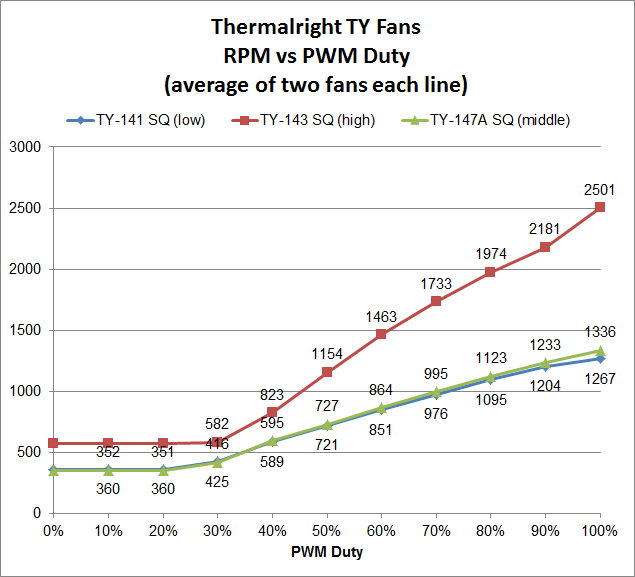 Below are the superimposed RPM vs. PWM charts for all three fans. The TY-143, of course, skyrockets above the other two. The TY-147A actually falls behind the TY-141 at the lower end of its PWM duty cycle, only to pull ahead slightly in the middle and upper ranges. 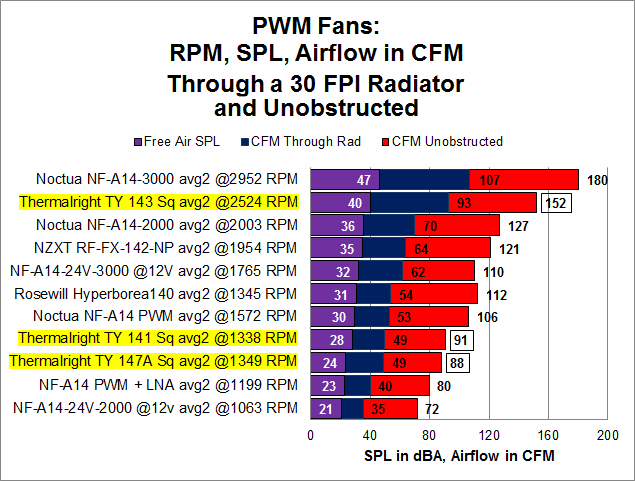 Essentially, though, the two fans have the same RPM response to PWM. It’s about time. 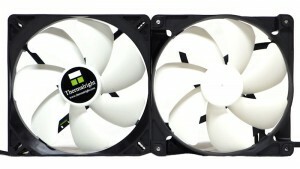 We enthusiasts have been waiting for Thermalright to make square versions of their long-famous TY fans. In the end, they did not disappoint. 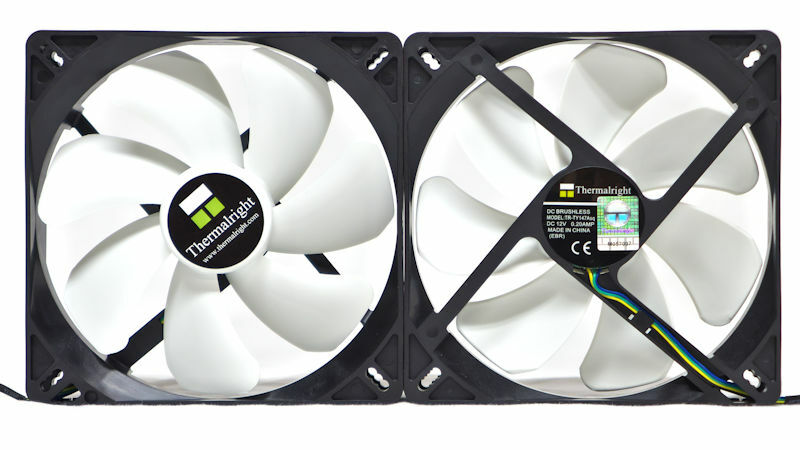 If you look at the specifications online at Thermalright, it looks like the square fans have a 10% lower CFM than the earlier TY fans. Turns out, that’s backwards. The current square TY fans are standard fans with standard frames. When Thermalright designed fans with splayed-out sides, they improved airflow by 10%. Since they were only making heatsinks back then, making those wide fans was the right call. Times are different now. 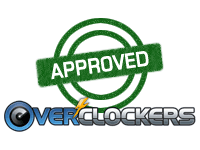 More people are building water-cooling systems, and more people are using AIO’s. 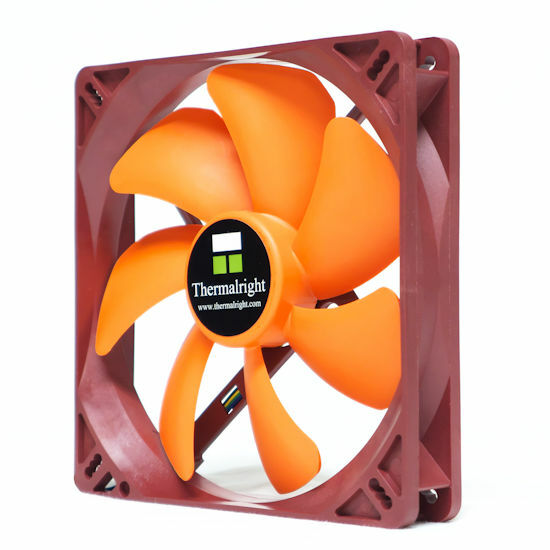 This calls for fans that can fit on rads, square fans — and that is just what Thermalright is bringing us now. More, Thermalright is giving us a choice: quiet fans (the TY-147A SQ) and performance fans (TY-143 SQ). And because these fans have PWM control, they only spin up when you need them. From the first of the TY fans, the TY-140, this series of fans have used something better than the ubiquitous sleeve bearing. 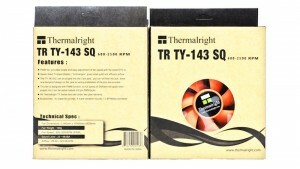 In the TY-141 SQ and the TY-143 SQ Thermalright use so called “2-ball” bearings. In the 147A SQ they use their EHFB. 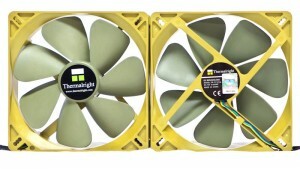 Because they are square, you can use these fans as case fans too, the TY-141 SQ and the TY-147A SQ in particular. 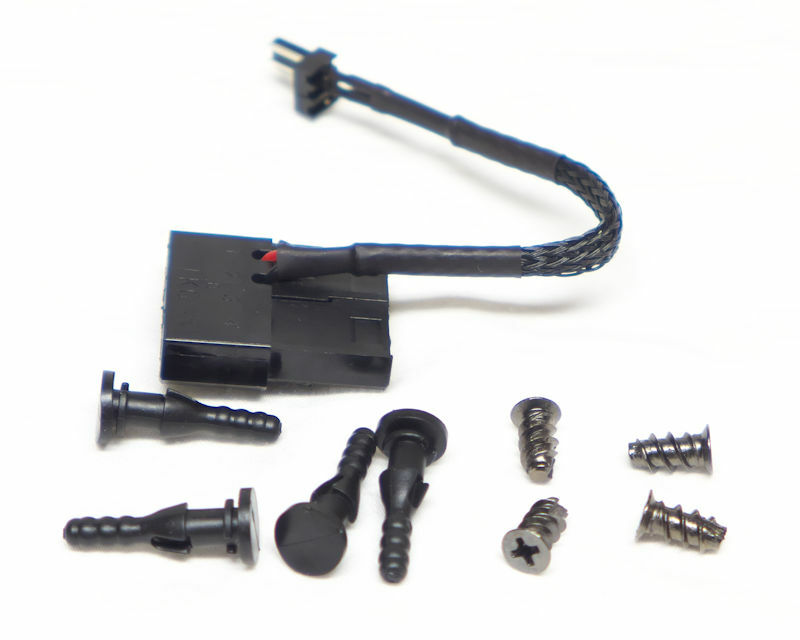 Among the accessories for each fan there is an adapter to allow you to power the fan directly from your PSU. 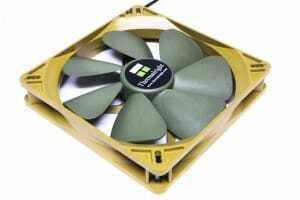 The fans also come with vibration isolators. The combination makes them great case fans. Overall, the fans reviewed here move a lot of air, and they do so quietly, or (after all, the TY-143 SQ is a performance fan) at least relatively quietly. You can look at the charts and decide what you need.